"The Silencer" - JJ (A.J. Cook) ponders the evidence as the BAU investigates the murder of a victim with the trademark handiwork of the UnSub “The Silencer,” who leaves behind victims with his unique trademark of sewing their mouths shut, on the eighth season premiere of CRIMINAL MINDS, Wednesday, Sept. 26 (9:00-10:00 PM, ET/PT) on the CBS Television Network. 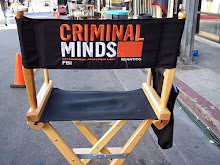 Photo: Monty Brinton/CBS © 2012 CBS Broadcasting Inc. All Rights Reserved.